Guest Crew Launches Social Features – Enjoy Now the Influential Marketing! Guest Crew is a new, but already pretty popular platform where to meet quality websites and excellent guest posts together. It was created in 2013 by Uttoran Sen, an experienced internet marketer who has been featured on popular sites like John Chow, Problogger, Kikolani and Copyblogger. 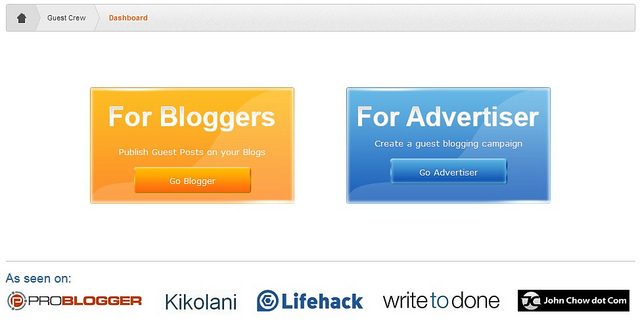 As a guest blogger, you may use the platform to find publishers for your articles. Guest Crew helps you connect with popular blogs in your market, which means new audience and new opportunities. If you are a blog owner, you surely understand the importance of publishing fresh content on your blog and Guest Crew is the right place to find great articles to post on your site. where 1 coin = $1 USD. The goal is pretty simple here : the more coins you collect, the more money you can withdraw. If you are already a member (if not, you can register here), you are familiar with Guest Crew dashboard. Here you can add your social profiles : Twitter and Google Plus. Uttoran Sen has announced that will finish soon to develop the app for Facebook, so for now you can connect your Twitter and Google+ account. After you have connected your accounts, you can configure them, setting how many credits you want to receive per post. A suggested amount could go from 0 to 5, but some popular and influential marketers could easily ask much more. After everything is set up, you can check your social offers here, where you want to approve or decline the available posts. You can start a social campaign, in order to promote Facebook post and page likes, post and link shares, or follow. Or else Twitter Status updates and retweets, or Google Share. Qasim of Msocialh won the first prize of Klinkk contest – do you want some cash too? 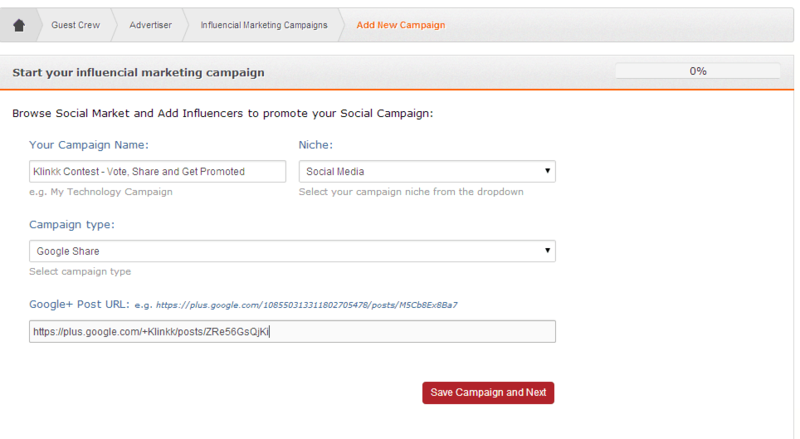 In the proper fields, you need to add your “campaign name”, selecting your “niche”, choosing a “campaign type” and then adding the link of your post. After this, you simply want to submit your campaign for the review. Remember that the credits you collect from the social offers you accept cannot be withdrawn for real money, but just used for social campaign. 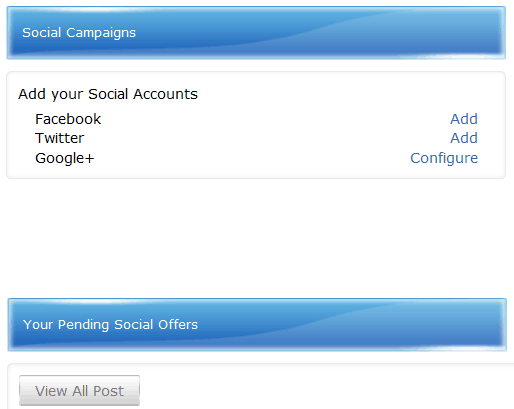 In the above mentioned case, I had 15 available social credits, for having accepted and posted a social offer. I can then use these credits to start a social campaign, like explained. Since Guest Crew keeps credits under control, so credits are much more valuable here. You should enter an amount from 0 to 5 credits for social actions like ReTweets, Google Plus, Facebook likes and the other social actions. 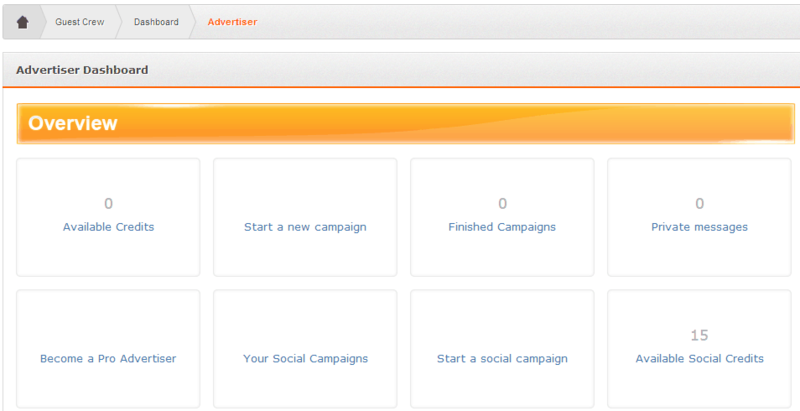 As advertiser, you can check the status of your existing social campaign here. In the screenshot, you can see the influential marketers displayed here. You can recognize my name, with my Twitter profile of +19k followers. Also, be sure to follow me on Twitter here! With social signals becoming more and more important in the internet marketing world, I find the new features of Guest Crew a great add. Be sure to check them out, and enjoy this new opportunity to promote your posts. Are you already a registered user of Guest Crew? Are you using it with great benefits? Its lovely Guest Crew has come up with social features. It would help in promotion as well as the spread of the word about the platform. Social signals should be converted and I guess this is what this platform is trying to achieve. Its good that members can now use opportunity to improve their social influence! In kingged.com, this article was shared for Internet marketers, and I have left the above comment after reading the post. Those are really interesting features, Sunday. Social is becoming more and more important in internet marketing. Uttoran is making moves! Nice developments over at Guest Crew. Thanks Erik! Thanks for visiting and commenting, my friend. Guest Crew is about spreading the reach of the advertisers, bloggers and other marketers. With social features, we are trying to increase that reach further. We are not allowing members to withdraw social credits in real money because that kind of conversion won’t be allowed by the social platforms. However, social credits can be used to start social campaigns. That’s a great feature of Guest Crew. Thanks for sharing your view, MSI Sakib. Thanks for the great review. Nice review about guestcrew and its new feature. Be sure to register to Guest Crew and try the new features, Fakharuddin! Thanks for sharing this awesome review about guest crew and its features, I liked your way of presentation and the influence of guest crew on social. It will really helpful for us. thanks for your visit and I am glad you enjoyed the post. Already aware of guestcrew and I must say Uttoran is doing really great at guestcrew. Have got some informative articles and it was really helpful. I think it’s great that Guest Crew has decided to expand its branches into our social media. Social media can be such powerful tools that can be used to disseminate various kinds of information to different kinds of people. This is truly a great news, Erik! Glad to know that you liked our idea about going social with Guest Crew. The potential with social media is just huge and we are already seeing a positive reaction towards our social features. Thanks for your feedback, Frank. I wish the social coins could be withdrawn too, but I guess Twitter and other social channels might not be too happy to do it. Very good site and Uttoran makes a really good job. Best tool Guestcrew, I’ve not checked it and after reading it will check it for sure. I’ve used my blog guest and post joint often and those are best in their own. Be sure to try Guest Crew, Alex. Mazing Social Features and an Initiative by Guest Crew, I will surely give it a go soon.